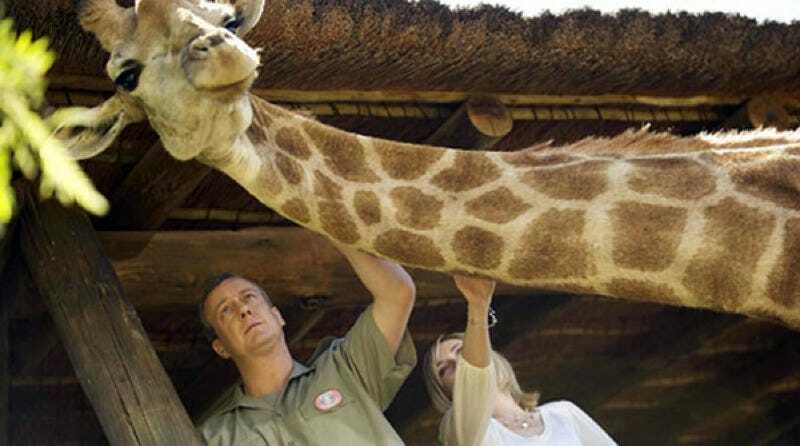 Featuring stunning proof that life sometimes imitates Far Side cartoons, this short piece on unusual giraffe deaths takes us through all the ways a creature with a long neck and no hands can perish, and there are some doozies. This one comes to us by way of Alexis Madrigal’s newsletter, Real Future. The post, courtesy of Tetrapod Zoology over at Scientific American, includes an image of a giraffe that died after wedging its head in a tree. On the one hand, this is very sad; on the other, it’s kind of gruesomely funny, in a black comedy kind of way. Top Image: Hamley, beloved giraffe star of ITV’s Wild at Heart, was struck by lightning in 2010.